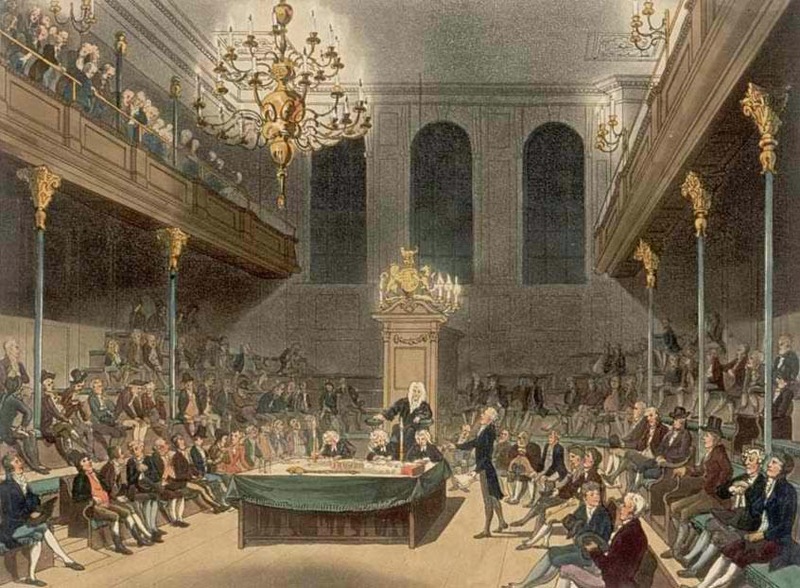 History Hoydens: Travels in England, 1782: Visiting Parliament. I'm really enjoying all the tidbits this book contains. Here's one about going to the House of Commons (and yes, women were allowed to visit and watch the proceedings!). Westminster Hall is an enormous Gothic building, whose vaulted roof is supported, not by pillars, but instead of these there are, on each side, large unnatural heads of angels, carved in wood, which seem to support the roof. When you have passed through this long hall, you ascend a few steps at the end, and are led through a dark passage into the House of Commons, which, below, has a large double-door; and above, there is a small staircase, by which you go to the gallery, the place allotted for strangers. The first time I went up this small staircase, and had reached the rails, I saw a very genteel man in black standing there. I accosted him without any introduction, and I asked him whether I might be allowed to go into the gallery. He told me that I must be introduced by a member, or else I could not get admission there. Now, as I had not the honour to be acquainted with a member, I was under the mortifying necessity of retreating, and again going down-stairs, as I did much chagrined. And now, as I was sullenly marching back, I heard something said about a bottle of wine, which seemed to be addressed to me. I could not conceive what it could mean, till I got home, when my obliging landlady told me I should have given the well-dressed man half-a-crown, or a couple of shillings for a bottle of wine. Happy in this information, I went again the next day; when the same man who before had sent me away, after I had given him only two shillings, very politely opened the door for me, and himself recommended me to a good seat in the gallery. And thus I now, for the first time, saw the whole of the British nation assembled in its representatives, in rather a mean-looking building, that not a little resembles a chapel. The Speaker, an elderly man, with an enormous wig, with two knotted kind of tresses, or curls, behind, in a black cloak, his hat on his head, sat opposite to me on a lofty chair; which was not unlike a small pulpit, save only that in the front of there was no reading-desk. Before the Speaker’s chair stands a table, which looks like an altar; and at this there sit two men, called clerks, dressed in black, with black cloaks. On the table, by the side of the great parchment acts, lies a huge gilt sceptre, which is always taken away, and placed in a conservatory under the table, as soon as ever the Speaker quits the chair; which he does as often as the House resolves itself into a committee. A committee means nothing more than that the House puts itself into a situation freely to discuss and debate any point of difficulty and moment, and, while it lasts, the Speaker partly lays aside his power as a legislator. As soon as this is over, some one tells the Speaker that he may now again be seated; and immediately on the Speaker being again in the chair, the sceptre is also replaced on the table before him. All round on the sides of the house, under the gallery, are benches for the members, covered with green cloth, always one above the other, like our choirs in churches, in order that he who is speaking may see over those who sit before him. The seats in the gallery are on the same plan. The members of parliament keep their hats on, but the spectators in the gallery are uncovered. The members of the House of Commons have nothing particular in their dress. They even come into the House in their great coats, and with boots and spurs. It is not at all uncommon to see a member lying stretched out on one of the benches while others are debating. Some crack nuts, others eat oranges, or whatever else is in season. There is no end to their going in and out; and as often as any one wishes to go out, he places himself before the Speaker, and makes him his bow, as if, like a schoolboy, he asked tutor’s permission. Those who speak seem to deliver themselves with but little, perhaps not always with even a decorous, gravity. All that is necessary is to stand up in your place, take off your hat, turn to the Speaker (to whom all the speeches are addressed), to hold your hat and stick in one hand, and with the other to make any such motions as you fancy necessary to accompany your speech. If it happens that a member rises who is but a bad speaker, or if what he says is generally deemed not sufficiently interesting, so much noise is made, and such bursts of laughter are raised, that the member who is speaking can scarcely distinguish his own words. This must needs be a distressing situation; and it seems then to be particularly laughable, when the Speaker in his chair, like a tutor in a school, again and again endeavours to restore order, which he does by calling out “To order, to order,” apparently often without much attention being paid to it. On the contrary, when a favourite member, and one who speaks well and to the purpose, rises, the most perfect silence reigns, and his friends and admirers, one after another, make their approbation known by calling out, “Hear him,” which is often repeated by the whole House at once; and in this way so much noise is often made that the speaker is frequently interrupted by this same emphatic “Hear him.” Notwithstanding which, this calling out is always regarded as a great encouragement; and I have often observed that one who began with some diffidence, and even somewhat inauspiciously, has in the end been so animated that he has spoken with a torrent of eloquence. The little less than downright open abuse, and the many really rude things which the members said to each other, struck me much. For example, when one has finished, another rises, and immediately taxes with absurdity all that the right honourable gentleman (for with this title the members of the House of Commons always honour each other) had just advanced. It would, indeed, be contrary to the rules of the House flatly to tell each other that what they have spoken is false, or even foolish. Instead of this, they turn themselves, as usual, to the Speaker, and so, whilst their address is directed to him, they fancy they violate neither the rules of parliament nor those of good breeding and decorum, whilst they utter the most cutting personal sarcasms against the member or the measure they oppose. A proposal was once made to erect a gallery in the House of Peers also for the accommodation of spectators. But this never was carried into effect. There appears to be much more politeness and more courteous behaviour in the members of the upper House. But he who wishes to observe mankind, and to contemplate the leading traits of the different characters most strongly marked, will do well to attend frequently the lower, rather than the other, House."